Palmer Pletsch Sewing With Sergers - This book has guided hundreds of thousands of serger owners. 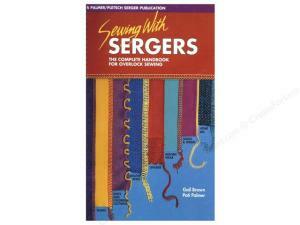 It is the book to have by your serger as you venture into this whole new realm of sewing. Learn your machine…and the basics of serging. Softcover, 128 pages. Sewing With Sergers has guided hundreds of thousands of serger owners. It is THE book to have by your serger as you venture into this whole new realm of sewing. Gail Brown and Pati Palmer hold your hand and you learn the machine... and the basics of serging. 128 pages.